Politics brings out the worst in people, by definition politicians are bread to lie and spread deceit. It’s not all their fault, sometimes they have to lie to try and jump in front of the closest competition. Think about the tricks Emperor Palpatine had to pull out of his cloak to manipulate Anakin. In Donald Trumps campaign to become the next president of the United States of America he (or at least a parody account) has resorted to a lot of dodgy publicity but now it looks like he has reached an all time low. 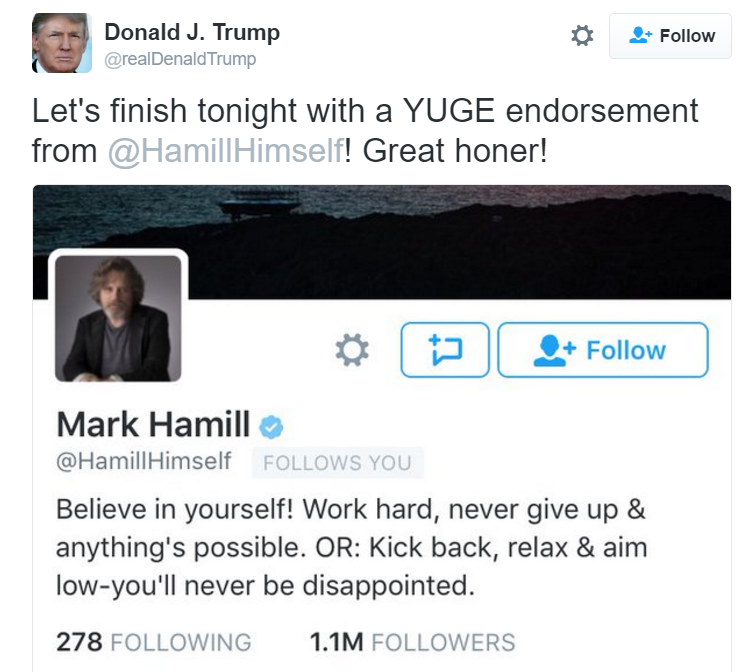 Let’s finish tonight with a YUGE endorsement from @HamillHimself! Great honer! In a swift response from Mark Hamill possibly from the set of Star Wars episode VIII. Now this sounds like Trump may have gone too far, you can’t just makeup an endorsement from a Jedi master. 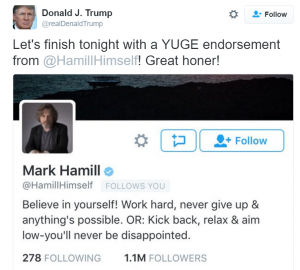 It might be that he took Mark Hamill following him on twitter as a sign he was a supporter. Either way it’s nice to see Hamill strike back in in such a way. Let’s hope Trump doesn’t try this again with him or he will see the return of a Jedi insult. 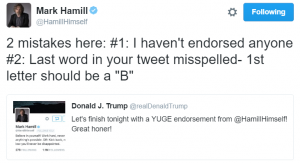 Although this is a parody account it’s nice to see Hamill deny any connection to Trump in any way.